(TODAY ONLY) HOT DEAL ON BLUETOOTH SPEAKER! HIGH QUALITY BLUETOOTH SPEAKER - The iF010 from iFox is a portable music speaker that packs a lot of power in its small body. Sporting a sleek, modern design, this music Bluetooth speaker combines functionality with excellent sound quality unmatched by any other comparable speaker on the market. 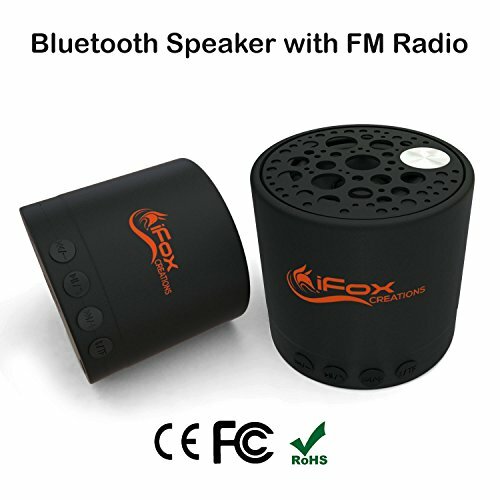 MINI FM RADIO SPEAKER - This innovative mini wireless speaker has a built-in FM radio tuner, allowing you to listen to your favorite stations everywhere you go. It comes with an AUX line-in cable that serves as an antenna. In just a few presses of a button, the speaker will automatically scan all available stations and save them as channels for easier navigation. EASY TO USE BT SPEAKER - Thanks to its straightforward button configuration, even your technophobe family member will be able to master the iF010 right out of the box. Using the four buttons on the front of this travel Bluetooth speaker, you can easily change songs and stations and switch between input sources (Bluetooth, micro SD, FM, AUX-in) in just 6 seconds. 6+ HOURS OF BATTERY LIFE - This rechargeable Bluetooth speaker comes with a built-in lithium-ion battery that can sustain it for 6+ hours of uninterrupted use. That way, you can enjoy your favorite songs, podcasts, or audiobooks without worrying about the battery. Also included in the packaging is a USB charger for easy charging and added convenience. IDEAL GIFT FOR MUSIC LOVERS ON THE GO - The iF010 Bluetooth FM radio speaker offers unparalleled sound quality with rich bass and crisp treble, which makes it a perfect gift for the music lover in your life. We also offer a one-year warranty, so if your speaker suddenly stops working for any reason, we will gladly replace or refund it.